Right now is the time for pumpkin everything, right? Duh, why am I even asking that, it’s October. 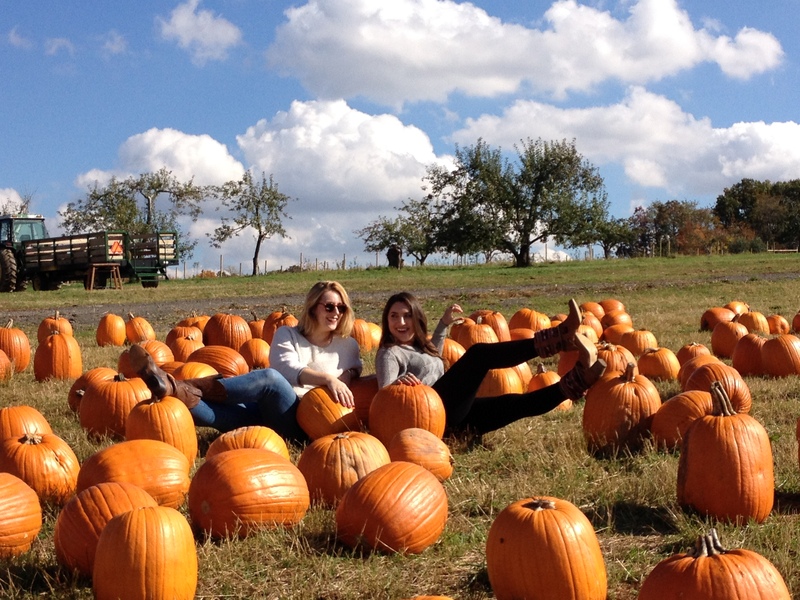 Pumpkins are the essence of October. 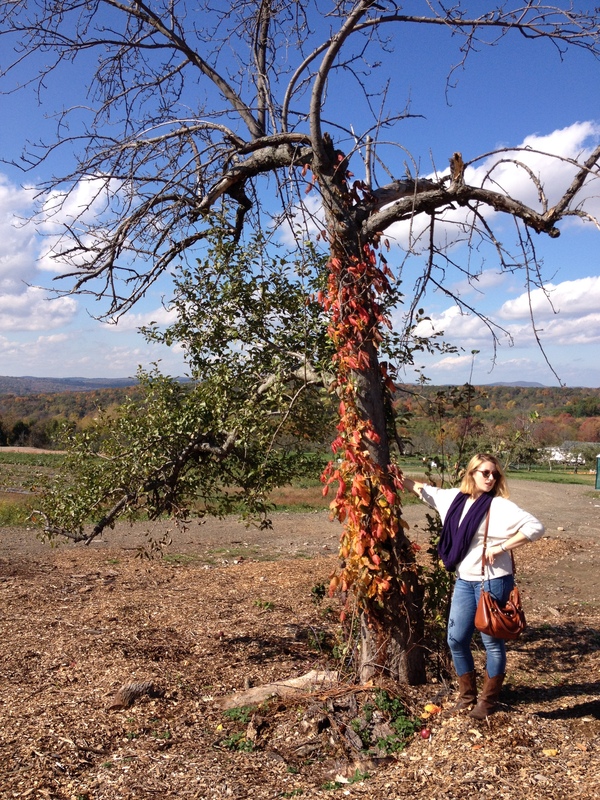 That’s why I took a vacation day just to visit a pumpkin patch on Friday. I had to get several small pumpkins and gourds for my fall tablescape…because this is what matters to me in the world. 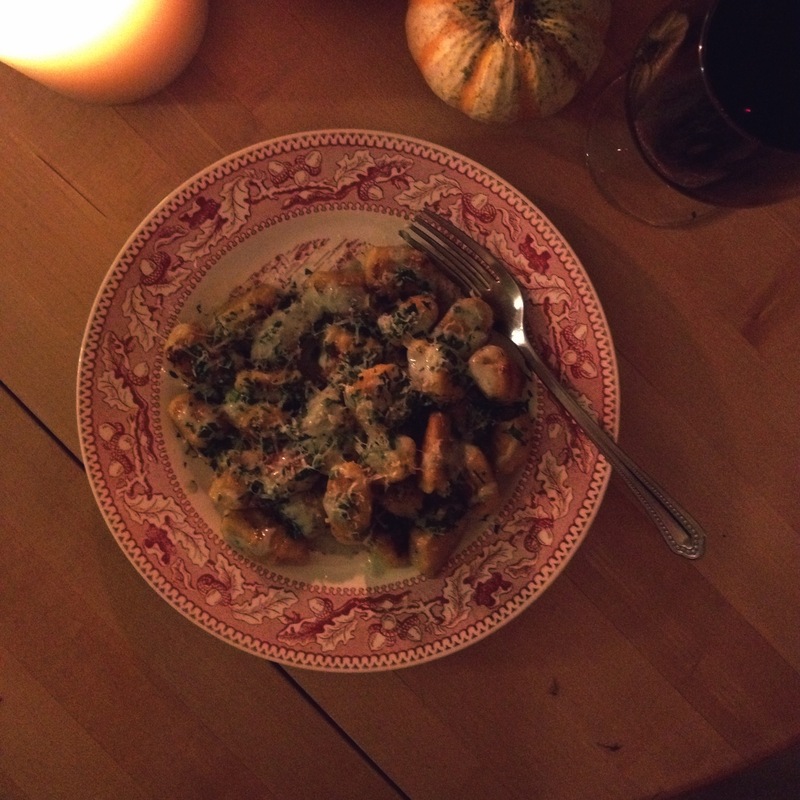 However, something had been troubling me all week; that something was pumpkin ricotta gnocchi. 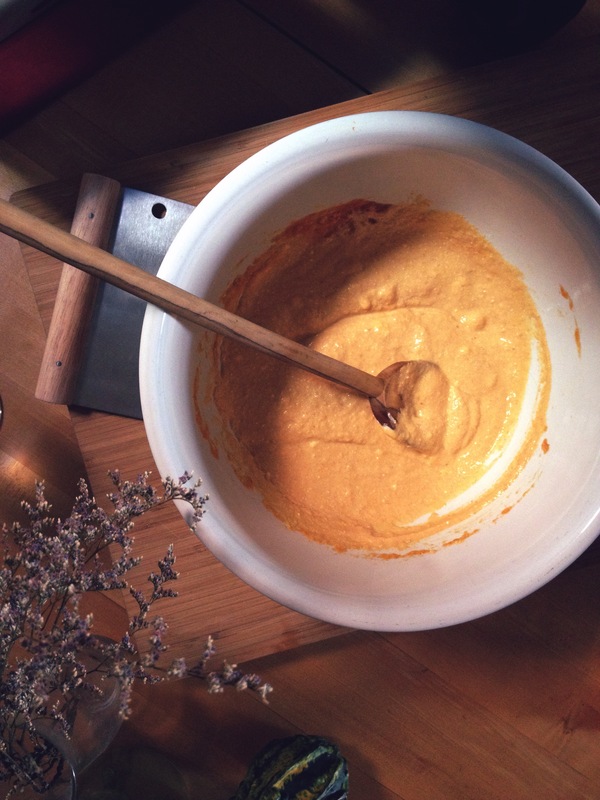 If you remember, dedicated reader, in my last post about Pumpkin Doughnuts I planned to use leftover pumpkin purée to make pumpkin ricotta gnocchi. So, one week ago, that’s what I did. I spent a lazy day mixing and rolling little orange dumplings to be boiled and then pan-fried in a sage brown butter sauce. Sounds perfect, no? Pumpkin – good. Sage – good. Butter – obviously very good. When all was said and done and I had plated those little suckers, the dish looked so pretty and dainty (I mean, as dainty as dumplings can be). After admiring my handiwork by snapping a ton a few shots, I took a bite…and much to my chagrin, it tasted bland! The gnocchi tasted normal, like there wasn’t even pumpkin in them! I felt so betrayed by the perfect, orange color. 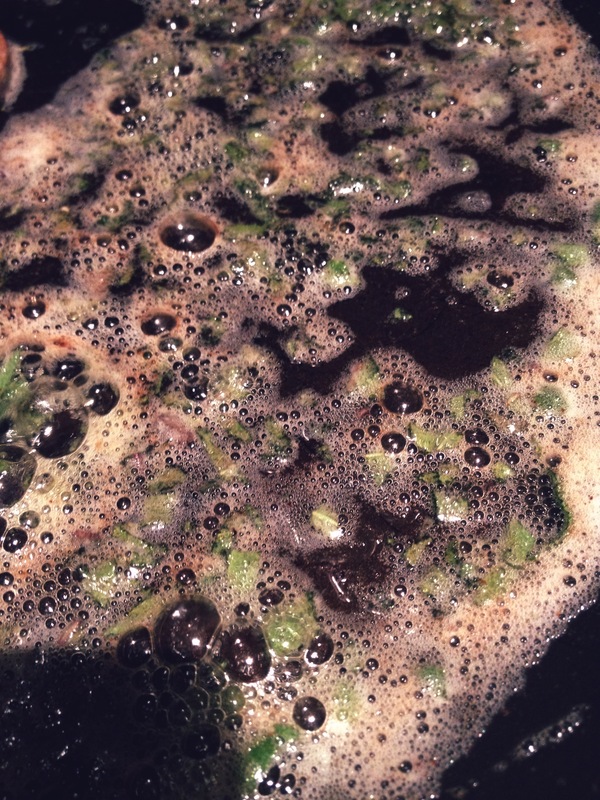 And the sage brown butter…what sage? I felt like I was eating something an eight-year-old would eat. There I was, trying to be the sophisticated and worldly twenty-five-year-old that I surely am, but instead I was eating pasta with butter. Nutmeg! There was no nutmeg in the recipe! Nutmeg is often paired with pumpkin (it’s a part of pumpkin pie spice) and other warm, savory dishes like macaroni and cheese. Just a little bit adds a great depth of flavor – something very much lacking here. How could I have not noticed that there was no nutmeg in this recipe? Gosh, it’s like I don’t even have a food blog. See Joy the Baker’s post for more. More pumpkin. I’ve noticed that pumpkin purée isn’t the strongest tasting purée out there. A lot of people actually use it to make baked goods moister because you’ll hardly notice the pumpkin taste. The problem here was that, um, I wanted to taste the pumpkin. If I were to re-try this recipe, I’d sub out some of the ricotta and add more pumpkin. Try a different sauce. I did this Friday night for dinner. I got some of those “pumpkin” suckers out of the freezer, fried them up, and I added a blue cheese sauce (just some heavy cream, blue cheese, salt and pepper, melted in a heavy bottom pot). It was pretty good…except it just tasted like blue cheese. Either way, the brown butter and sage sauce was a let down. Options: add more salt and more sage. That’s all I got right now. Last night I told my grandfather about this dilemma and he said, “It didn’t taste like pumpkin? Hm. Good.” Then I realized – maybe some things in October can be pumpkin-free. Boom. There’s a truth bomb for ya. In any case, the gnocchi tasted fine, just not like pumpkin. 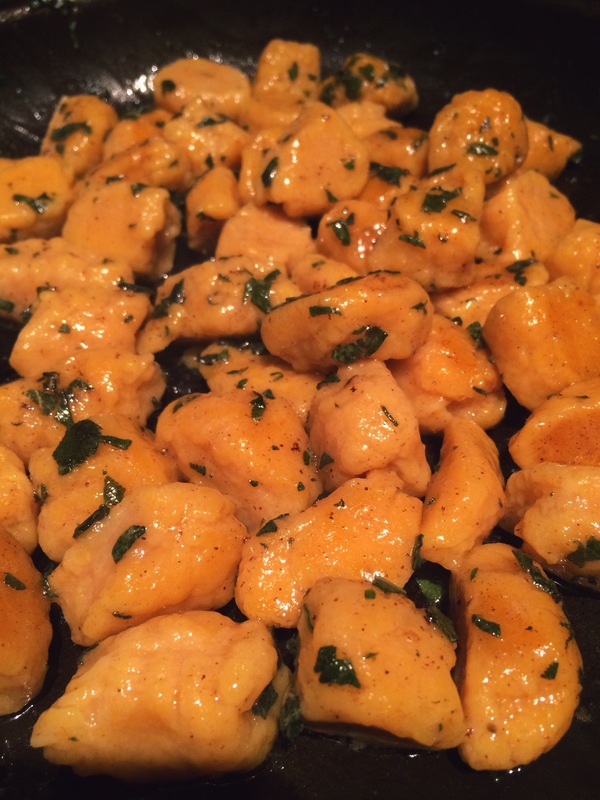 I would say if you’re going to make ricotta gnocchi, use this recipe, or one that’s similar to it. It’s simple, easy, and dependable. 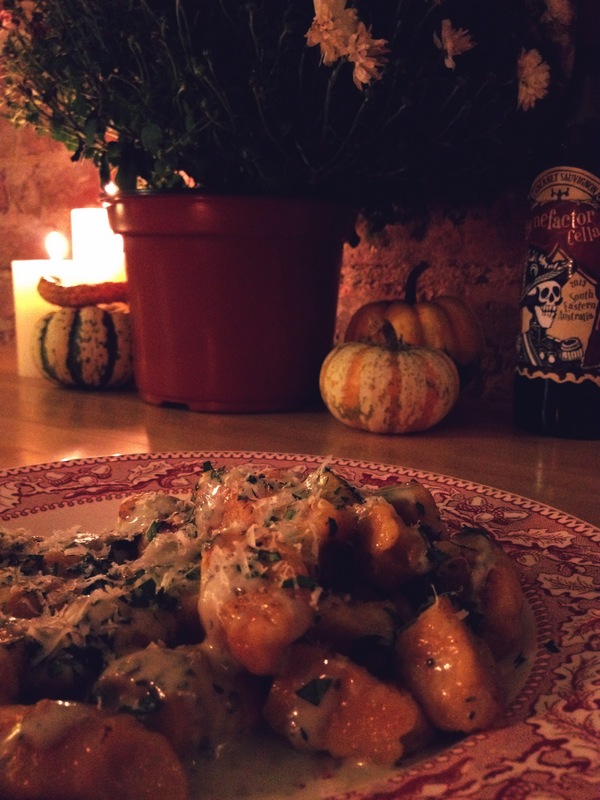 If you want to try your hand at the pumpkin gnocchi, go for it. But promise me you’ll try to spice it up a bit? And use nutmeg!!! 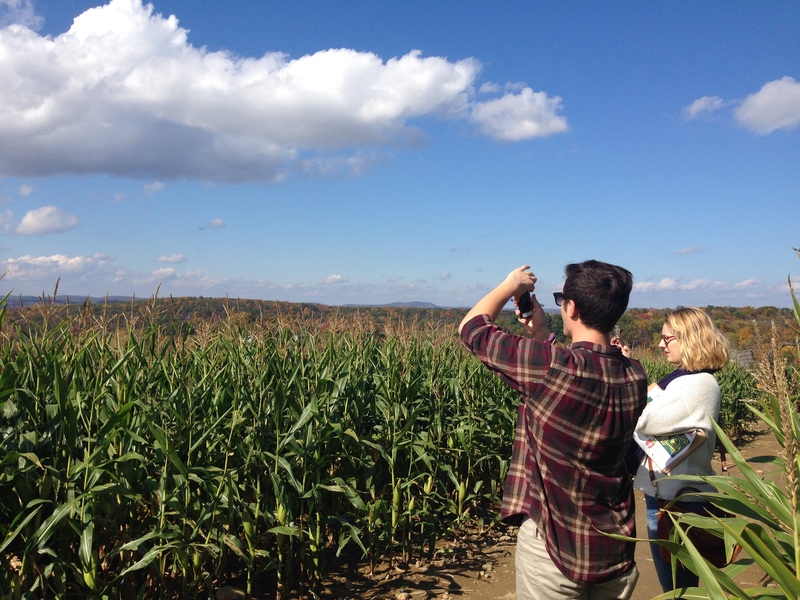 If you’re similarly disappointed, go to a pumpkin patch and walk through a corn maze with some friends. It’ll restore your faith in the power of pumpkin, I promise. 1. 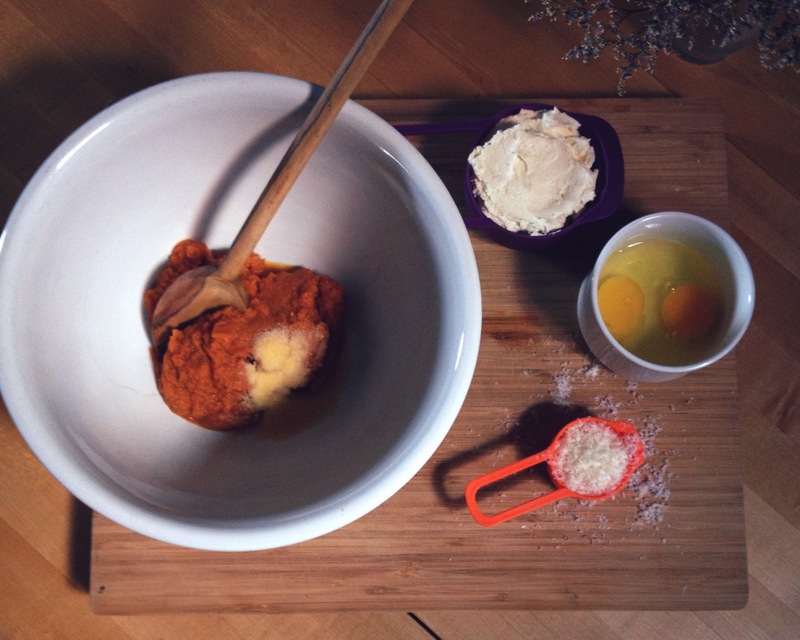 Mix the pumpkin purée, ricotta, parmesan/pecorino, eggs and salt together in a large bowl. 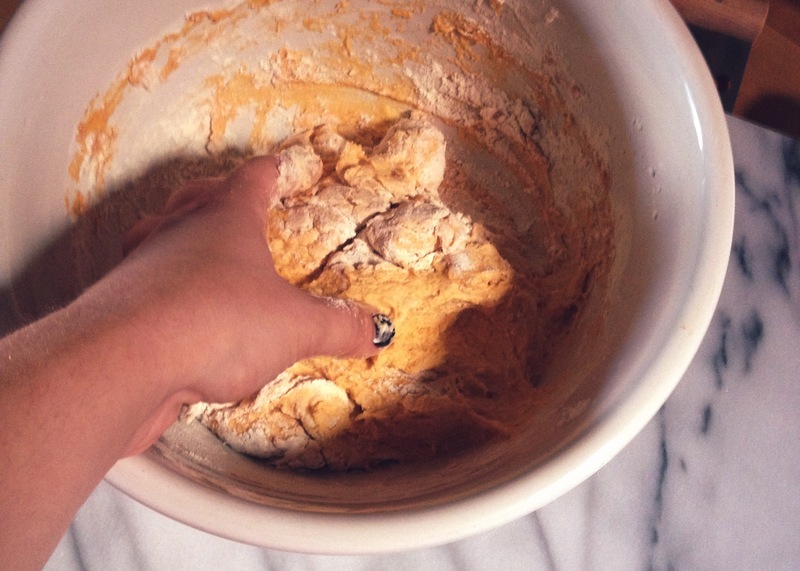 Add 2 cups of flour and mix by hand or with a spoon. The dough should be very sticky. 2. Add another 1/2 or full cup of flour. The dough should still be sticky, but pliable enough to form into a large log. If not, keep adding flour, little by little, until you can get the dough to be rollable, but still soft. 3. 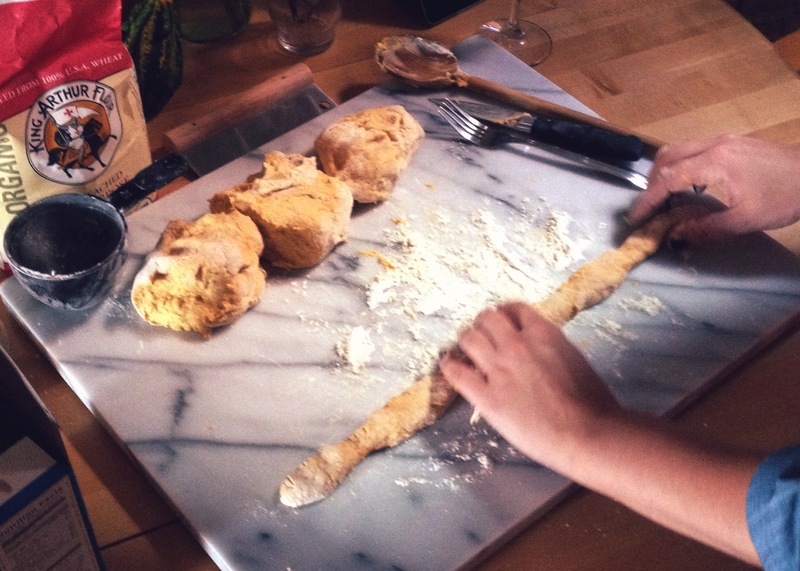 To form the gnocchi, dust your work surface with flour. Cut the long into 4 equal pieces and then cut those pieces in half. Take one piece and roll into a rope-like shape about 1/2 an inch thick. Then, cut the rope into pieces about an inch wide. 4. 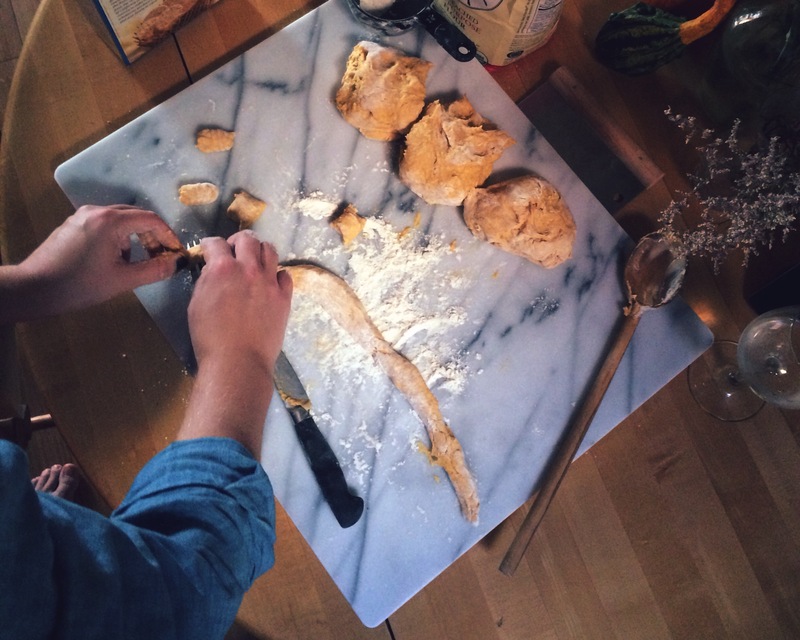 Roll the gnocchi over the back part of a fork to create ridges. This is not necessary, but it helps your sauce hold on better. 5. 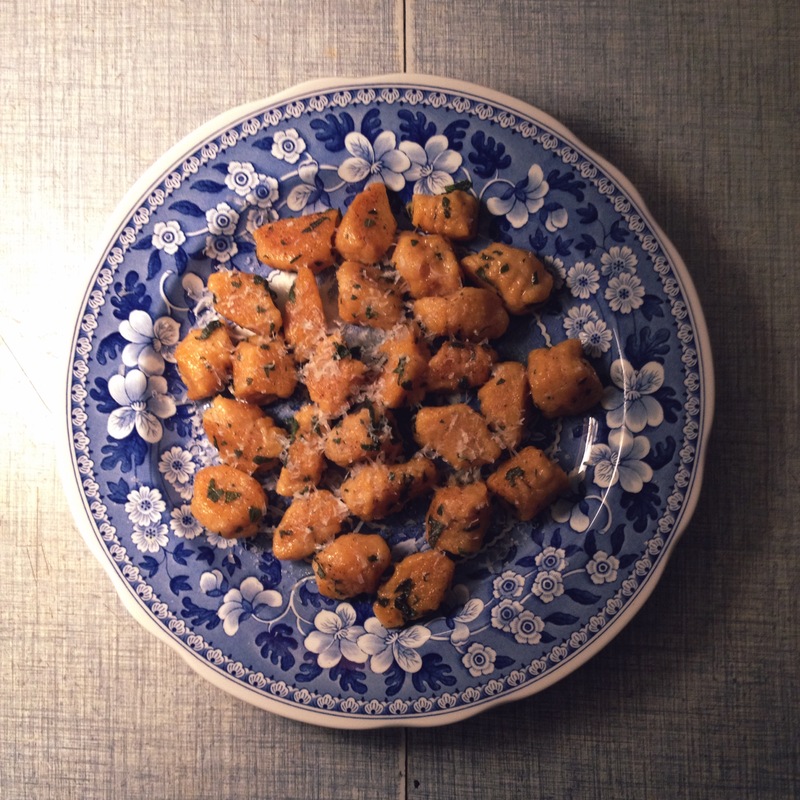 Place the gnocchi onto a lined sheet tray or two. 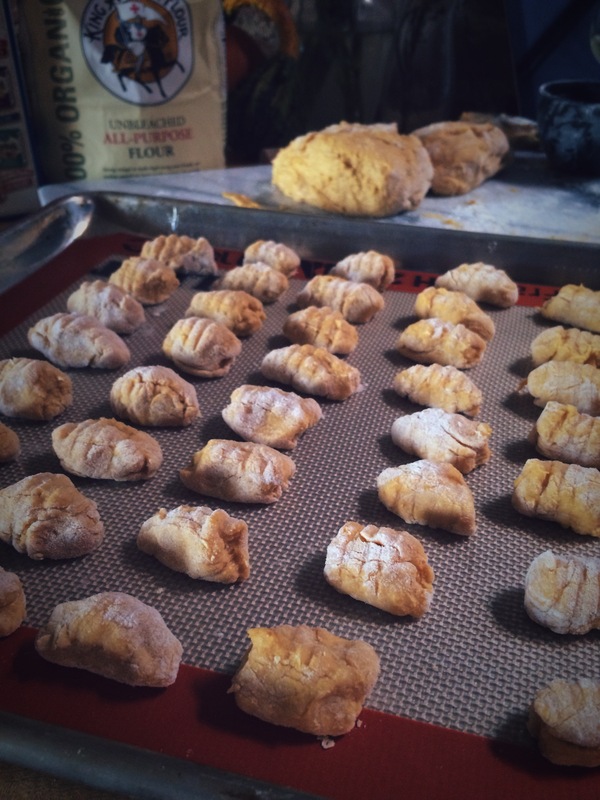 Now you can either flash freeze them (put the trays in the freezer for about half an hour and then dump the gnocchi into a bag to keep for another time) or boil some water and get ready to cook them. 6. Meanwhile, add the butter to a large skillet over medium-high heat. Add the sage and stir constantly until the butter begins to smell nutty and brown. I would also add a little salt at this point. If the gnocchi aren’t ready yet, lower the heat or turn off completely until the gnocchi are ready to be added. 7. When ready to cook the gnocchi, boil a large pot of water about 3/4 full and salt generously. 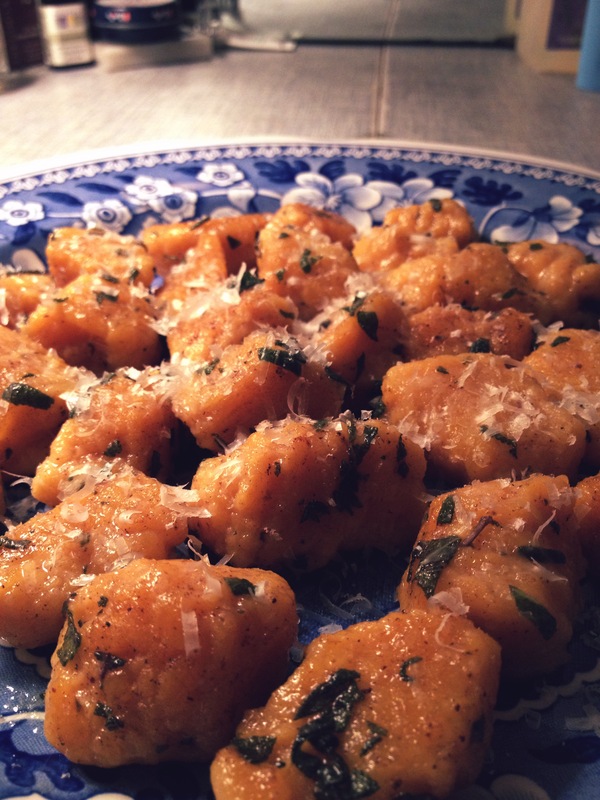 Drop the gnocchi in in handfuls. Once they start to bob to the surface, they’re ready to come out. Skim them from the surface. 8. Turn the heat back on under the skillet (if turned off), let it heat back up and start adding the gnocchi until they’re all in. Try to keep them in one layer. Shake the pan to coat the gnocchi and leave undisturbed for about 60 seconds. Try to get a nice crispy crust on most of the gnocchi. 9. Sprinkle with parmesan or pecorino and enjoy. It may not taste like pumpkin (or it may, depending on your adjustments), but it’ll still be warm, hearty, and homemade. Oh my goodness, Tory! Looks so yummy! I, for one, think the pumpkin trend is all played out. I am especially appalled at all pumpkin drinks: pumpkin coffee—eeew! I’m with KVS, the two pumkin coffees I had a Dunkin Donuts last weekend tasted harsh and artificial. I love the flavor also, but maybe it is better enjoyed in a great baked good with lots of nutmeg! 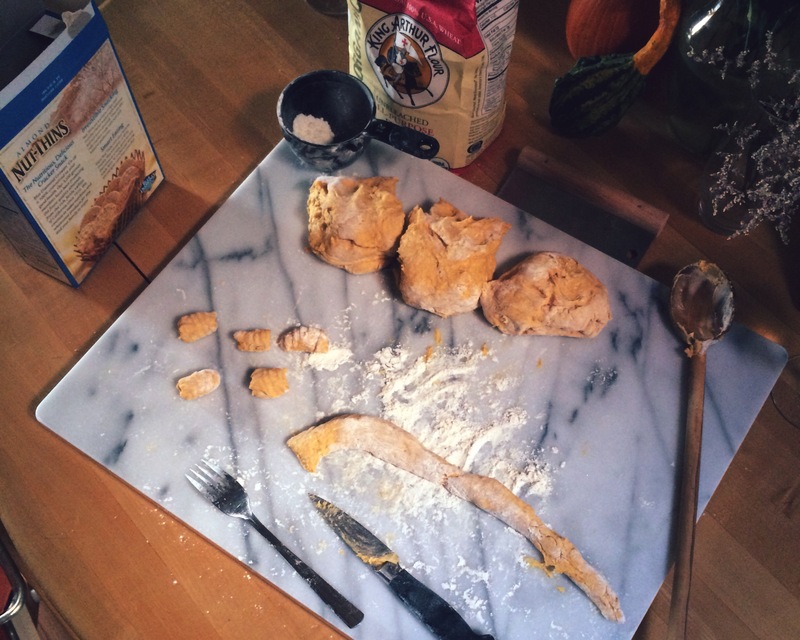 In fact I have a fabulous pumkin cookie recipe I will have to make before the season ends!